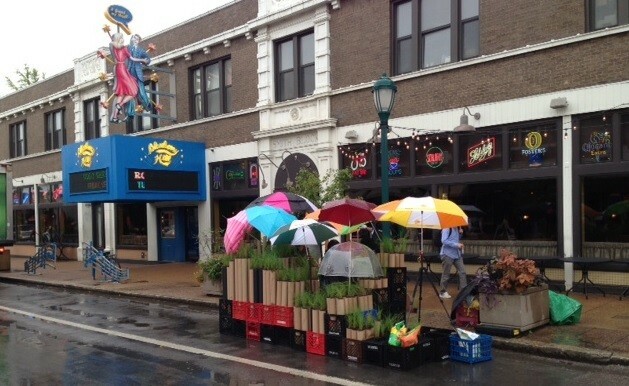 Park(ing) Day finds a toehold on the Delmar Loop. They arrived at 7:30 this morning, long before Delmar Avenue would fill with traffic. Soon they had transformed a metered piece of asphalt in front of Blueberry Hill into a makeshift greenhouse with donated plants from Bohn's Farm, borrowed milk crates from area grocery stores, and a half-dozen hastily assembled umbrellas (the latter a much-needed addition on this rainy Friday). They are Joanie Walbert, Ylan Vo and Melanie Anderson, landscape architecture students at Washington University, and they are one of a handful of St. Louis' groups participating in today's Park(ing) Day. The annual event began eight years ago in San Francisco and has since spread to dozens of countries and hundreds of cities. 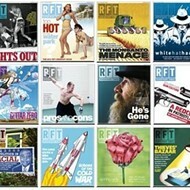 Its mission: to encourage more urban open space and generate debate about how public space is created and allocated. 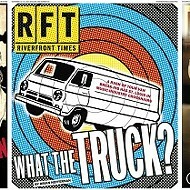 Park(ing) Day officially arrived to St. Louis in 2011. 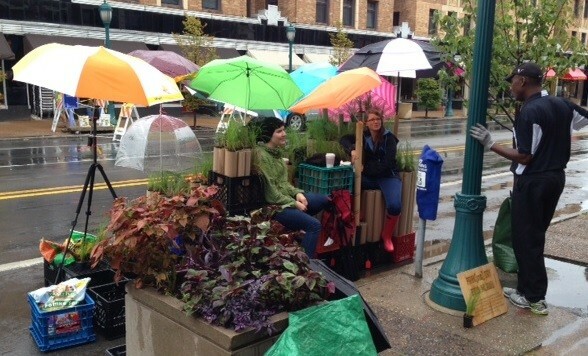 Look for other local Park(ing) Day installations downtown today and along Cherokee Street. 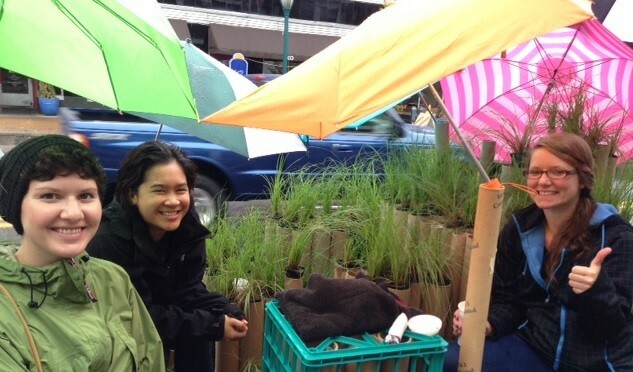 Joanie Walbert, Ylan Vo and Melanie Anderson of Washington University's landscape architecture program.